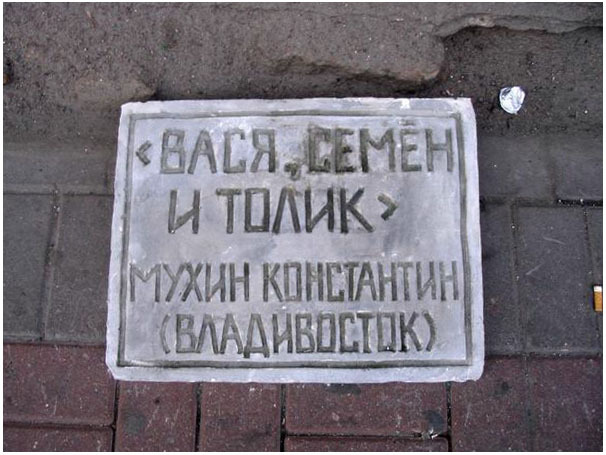 > Shugurov Pavel "Review of Art in public spaces in Russia 2000s"
Главная \ Статьи о монументальном искусстве \ Shugurov Pavel "Review of Art in public spaces in Russia 2000s". 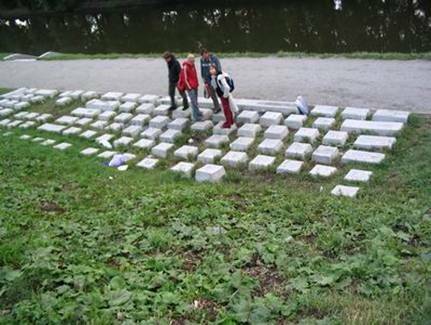 Review of Art in public spaces in Russia 2000s. 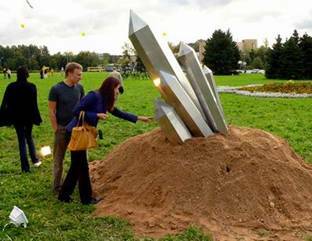 Term “public art” which is so popular in the USA got its new meaning in Russia . It is considered to be placed somewhere between monumental-decorative art and graffiti. Monumental-decorative art means “city art” (monuments and tombs, sculptures, pictorial art, mosaic, glass painting, city and park sculpture, fountains, etc.). 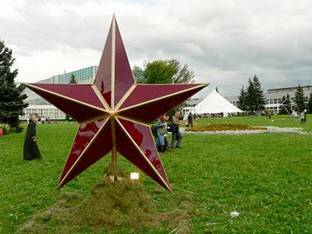 All of them continue traditions of Soviet monumental art according to the following features: 1. initiated by the authorities, 2. guiding the main function of propaganda the most common social and philosophical ideas of those times, which aimed to commemorate an outstanding person or a date. 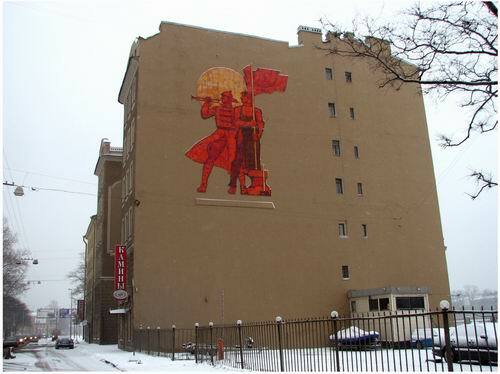 Soviet monumental art was systematically supported by the government, and for a long time had been one of the main means of propaganda. It was placed on a special position among other Soviet arts. Monumental art was raised to the high artistic level and can be studied as a phenomenon in the world history of arts with its theory and methodology being worked out and passed on by the experience of artists. 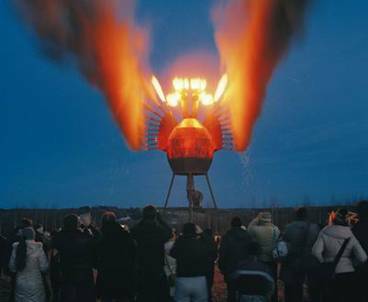 Here are some examples of Soviet monumental art projects. Ceramic panel. Savushkina str. Saint-Petersburg. Graffito “Worker”. Narvskaya square. Saint-Petersburg. Mosaic “Chemist”. Dobrolubova prospect. Saint-Petersburg. 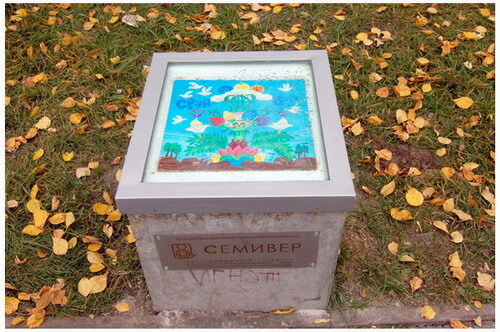 Mosaic by Anopova V. “Star sign”. Comsomola str., Saint-Petersburg. 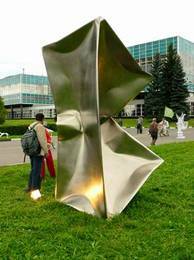 Since 1970th monumental art started facing the crash. Mainly because of spreading of television and it lost its first positions as means of Soviet propaganda, and later it completely disappeared with the fall of Soviet ideology. Though the amount of realized projects in the city limits decreased rapidly, schools of arts suffered hard times, but nevertheless survived and still have graduate students-specialists in monumental art. Due to no interest from customers, schools suffered greatly. But still they continue to teach artists who are ready to work professionally in architectural spaces and express common and modern ideas of the society. 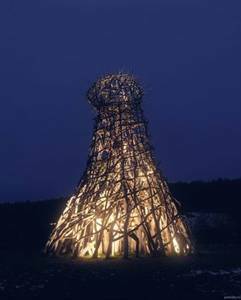 I guess it is logical to consider that in better circumstances these artists will be able to return the “height” of the style and professionalism in social art, to find and reflect contemporary ideas in adequate modern architecture and artistic forms. 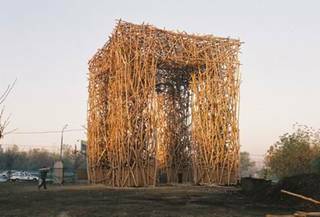 We will finish our review with the glance on the main projects of contemporary monumental art. And now let’s move on to the graffiti – another side of city art. 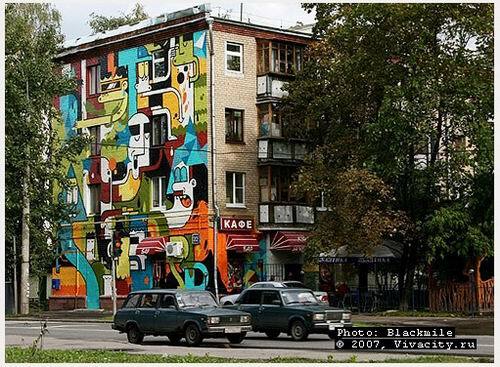 Graffiti appeared as a kind of art in Russia relatively recently. But thankful to its aggressive position, extreme and youth, being opened to people and lack of professional criteria, altogether with the support of mass-media, graffiti easily fixed both in professional and common area. Nowadays term “graffiti” holds a kind of negative meaning in the society. And street artists who became specialists have to search for new ways and new terms and forms of expressions (e.g. competitions, festivals) for posing and developing their work as a legal art. Here is an example of legal project-festival “Meeting of styles”. More than 30 artists from different countries took part in it. 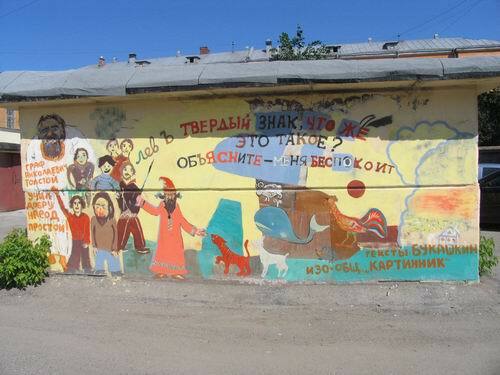 Only westernized paintings are called graffiti in Russia. But a vast majority of private projects and creative decorations do not have their particular name. 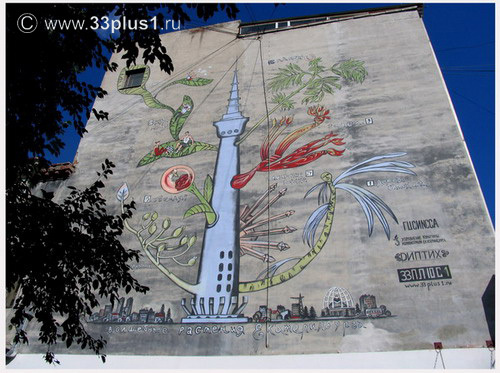 Mass-media gives explanations of these projects as murals, wall paintings, actions or paintings on the buildings, seldom you can hear – Russian graffiti, etc. These are the most interesting facts of contemporary art in public spaces from my point of view. In these creations national cultural tradition and original world of art can be traced. 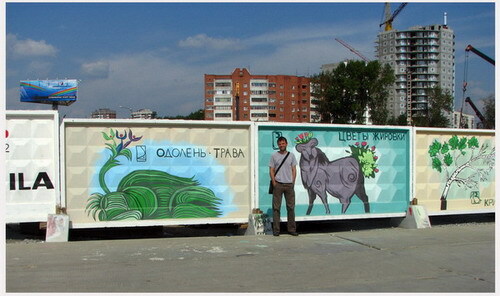 First of all I want to present you illegal street initiative of independent artists, such as paintings by Ovchinnikov, who made famous a small town called Borovsk, which is near Moscow, with the help of his art. He made this city a kind of tourist attraction. Relief by Miller K.. Kamennoostrovsky prospect. Saint-Petersburg. Mural in the yard. Saint-Petersburg. 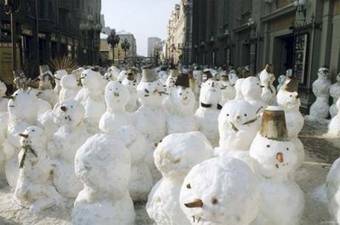 Group “Sneg”. Hardly ever, but sometimes it happens that corporations order or support artistic initiative in public spaces. Especially when it is in their property. Certainly these projects differ in large scope and quality of execution. 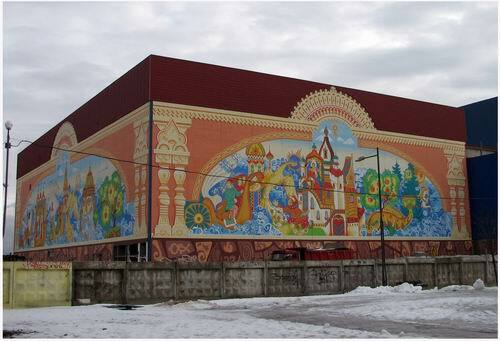 One of the examples of art initiatives by private commercial investment is a shopping mall “Benua” in Saint-Petersburg. Shopping mall “Benua”. 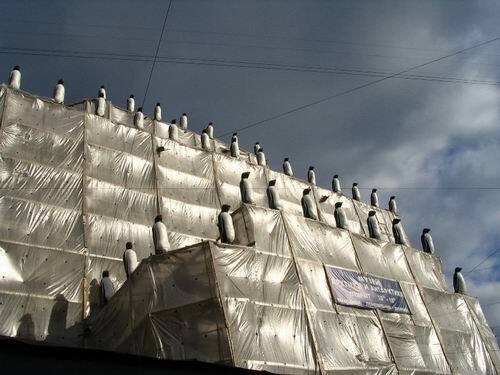 Smolenskaya embankment. Saint-Petersburg. Archive of S. Choban. Shopping mall. 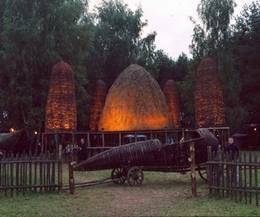 Park of 300 year anniversary of Saint-Petersburg. 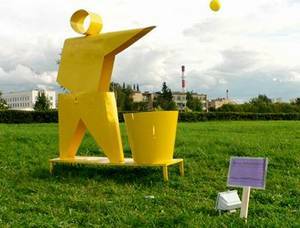 Term “public art” is used in Russia to identify art interventions in city spaces, abstract or conceptual kinds, usually of temporary quality. 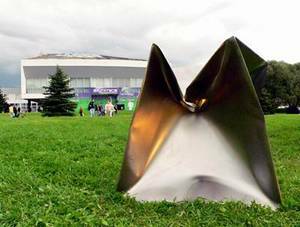 When Russians say “public art” they usually mean either street installations or some unfigured sculptural projects. 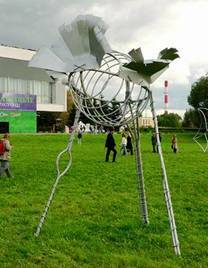 Public art festival “Long stories of Yekaterinburg”. Public art is that what we do not understand, but admit its art value. 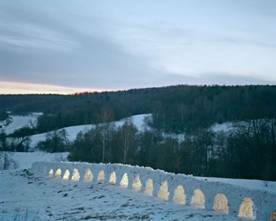 Art community “33 + 1”, which I represent here, has vast practice in creation of both public art projects and self-contained festivals. 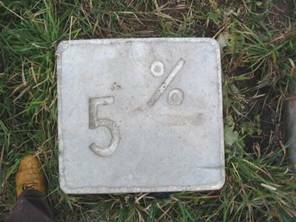 We consider these projects as a possibility of experimentalism in city environment and attention on the audience unprepared to art perception. 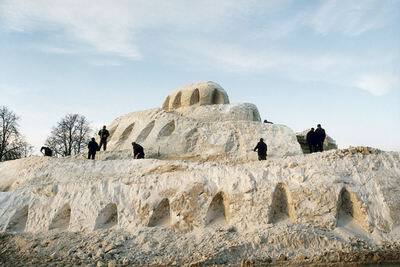 As these projects are temporary we can allow wider creative latitude, than in our sustainable monumental art. 33+1. 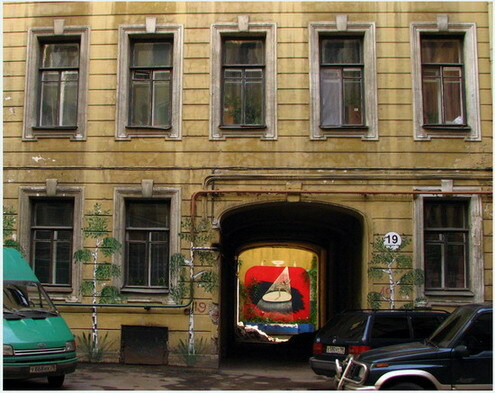 Project “Vasya was there”, Saint-Petersburg, 2005. 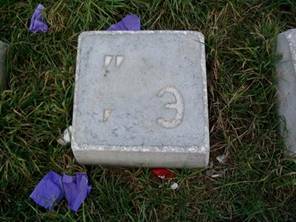 33 concrete tablets marking space of Liteiny prospect. Our art community created 33 magic animals, then opened Internet portal, where citizens could take part in creating new myths. 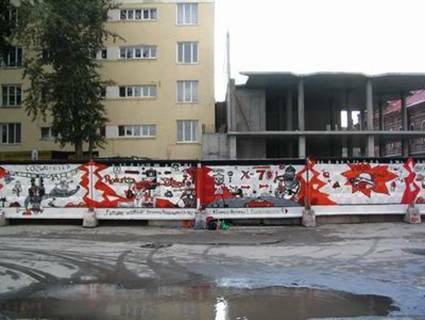 According to the created myths we made mural on the wall of a 5-storey building, 20 sections of a temporary building fence and set 7 concrete street installations in which art paintings were put under the panzer glass. In this very project made on the rampant and garage gates of Bishkek art museum, we depicted mythical images of Kirgiz and Russian totems: Matreshka and Balbaltash and steps of their lives. Here you can see 33 works on glass which work by stack-up real landscapes and a paining on the glass, which represent the main views of Saint-Petersburg. In this very project we illustrated the mythology of legendary balcony which is famous for Lenin’s speeches after of Revolution 1917. We set a figure of speaker who expressively declares a new, but ununderstandable idea. 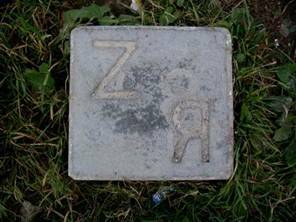 In retrospective of our street installations with all their stylistic dissimilarity, main direction can be seen: they all have conceptual trend about local mythology and "spirit of place". Going back to review of Russian social art, we cannot but mention the creations by an artist N. Polissky from Moscow. 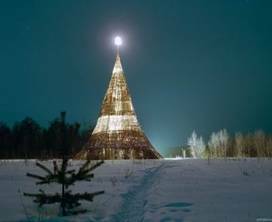 He is seen as a Russian land artist. 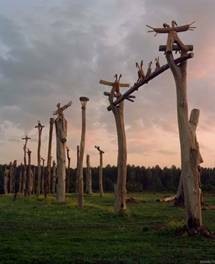 Actually, land art which is so popular in Europe, in Russia with its all rich land resources is not developed at all. 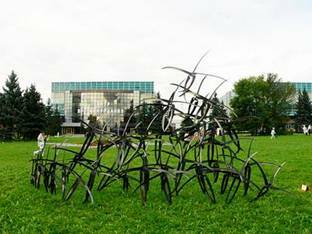 Apart from Polissky and some commercial artists and land-designers, who are busy making flowerbeds, no one is interested in this particular style of art. 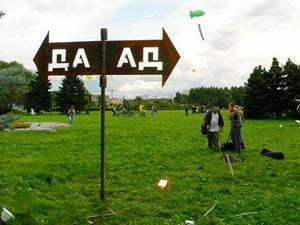 Organizations and funds which support financially public art in Russia and give birth to art open-airs give them temporary carnival specifics. 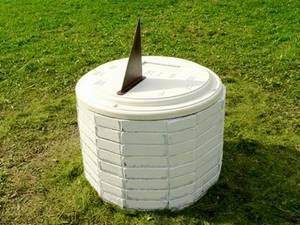 Such organizations are interested in garish and low-budget art, their aim is to demonstrate activity and advertisement. For big permanent profound projects which demand official agreement and capital investment they have no money and no human resources. City governments support big profound projects with money, but they call their projects not “public art”, but “art development”. 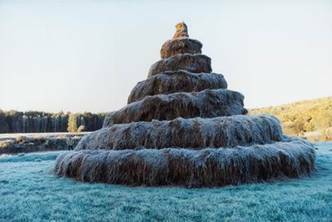 According to their budgets and social direction these very projects form the most interesting section of contemporary Russian social art. 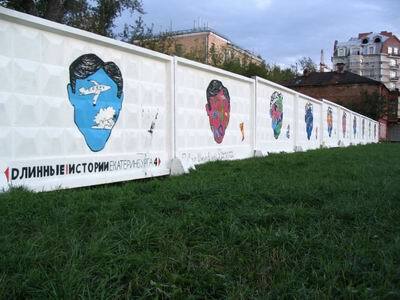 First example of official art initiatives I want to present you is the decoration of the yard in Doinikov lane, Saint-Petersburg. 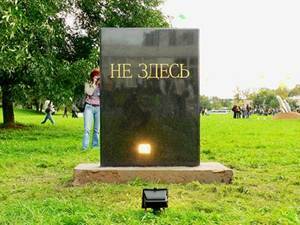 Decoration of park of Composer Petrov in Kamennoostrovky prospect, Saint-Petersburg. Sculptures-metamorphoses of a violin-armchair, violin-apple, etc. Our studio participates in art redevelopment of the city. 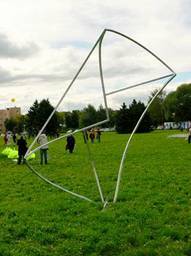 Projects of this style and direction differ from temporary public art projects because they catch more attention to citizens’ interests, unaggressive forms, more architectonics to environment. With the help of interactive things, found during our experiments, we managed to widen the frames of standard “art redevelopment and decoration” in this very project. 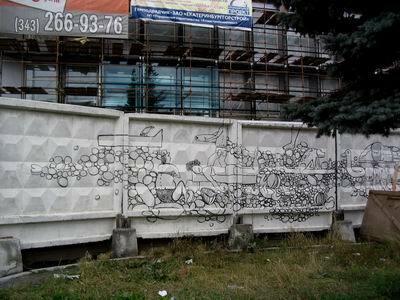 At first, lower part of mural – “sea of graffiti” - we presented as a surface for practice for training young graffitists. We had a goal to include drawings which do not exist yet in composition, but which will appear in future. 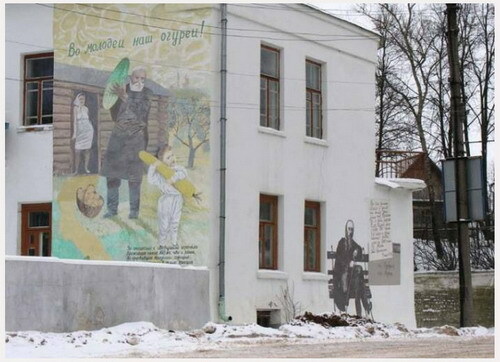 Secondly, we painted particular skaters: according to photos of heroes of local society, thus creating not only a decoration of the wall, but also a mythology of place. We hope that in our future projects we will develop this concept more. For this reason before we begin our work we gather full historical background of the place, hold sociological monitoring. But for sure we have plenty of work to do to get to the perfection of Soviet monumentalists in treatment of architectural composition and stylistic adjusted forms. Monumental art is not dead, it is just waiting for the right time. Artists are looking for actual terms and forms. And I want to illustrate it with an example of contemporary monumental art. Wall-memorial for women of World War II, Kronverkskaya str., Saint-Petersburg. At the end of our review I want to show you a summary of mentioned above structure directions, which can be marked in contemporary Russian art in public space, starting with unprofessional and finishing with the professionals of the highest rate. 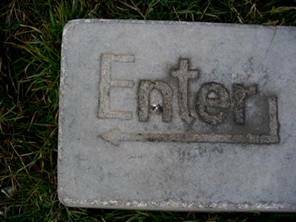  Public art (installations in open-air, art actions in open-air). 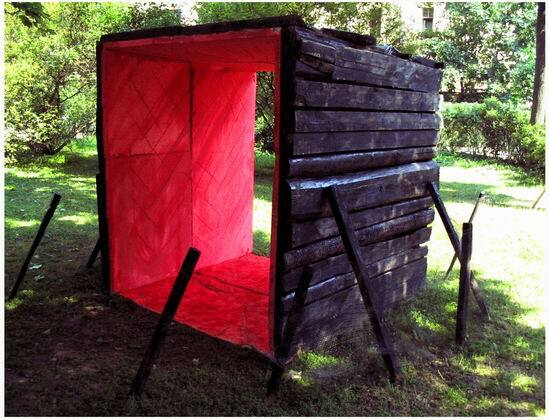  Private art initiatives in city space (by artists and private customers).  Commercial art initiatives in public space. 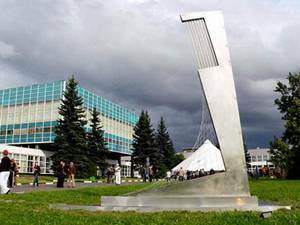  Art redevelopment (monumental-decorative art).